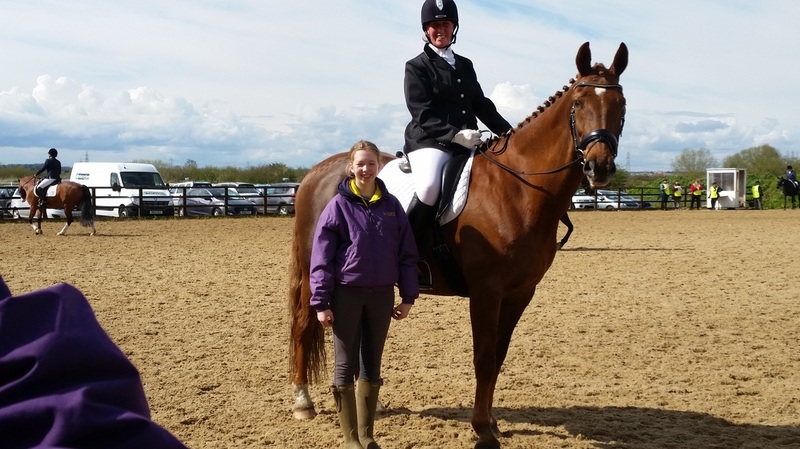 Lisa and Caitlin Fahy were competing their horses Kings Court II and Moonshine Boy in the Dressage competitions. As per usual, the journey around the M25 was awful. What should have been a 2hr 10 min journey took 3hrs 45 mins and then once arrived at Bury Farm there was a heavy hail storm which soaked the horses at the check-in! Once thawed out it was time for Lisa and KC to do their Novice 30 test. The warmup was great and although busy KC settled in well and got on with the job in hand and even the sun came back out to cheer everyone up. Lisa went in to do her test but unfortunately when she got to her arena they announced her through very loud and crackly speakers right next to letter A and all the banners. Poor KC got the shock of his life and jumped up and spun around and didn't want to go anywhere near the banners or letter A so Lisa had to turn away and try going around the arena the other way! KC wasn't that keen on going to A that way either but the bell had gone and Lisa had 1 minute to get into that arena - in the end walking backwards/sideways was the trick and they trotted just as she turned at letter A! Suffice to say if the 1st half of their test had been as good as the 2nd half they would have been in the top 10. But it took a lot of calm riding to get KC though the test and Lisa was very proud of the way he finally settled down and finished on a score of 64.23% in 12th place. The next day was Caitlin's turn. Both horses had had a good night and enjoyed some in-hand grazing in the morning. After KC's antics with the announcements Caitlin wanted Shaun to do the Arena Familarisation. He was very well behaved but a bit put out by the fact that the flowers at the arena markers were not edible and in fact plastic! 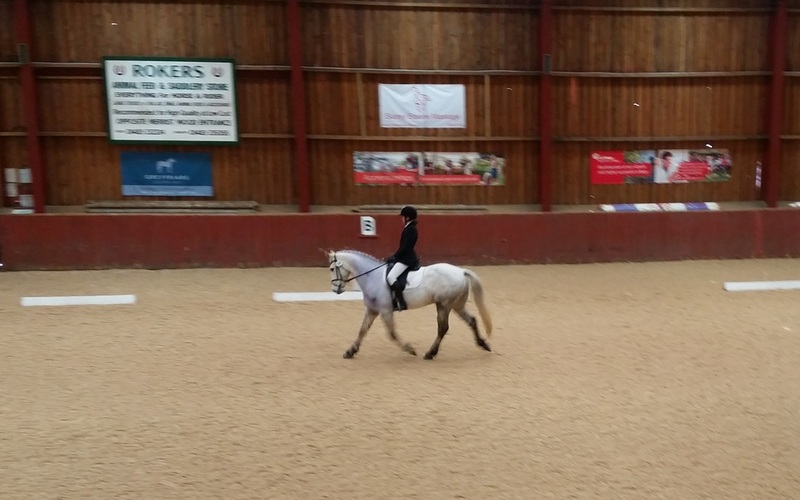 Caitiln too had a good warm up and followed her lesson plan that she had gone through a couple of days before with Hinda. This worked a treat and set them both up well and helped take Caitlin's mind off the fact that Juniors go up to 18 yrs and there were lots of older experienced riders on large horses in with her! So in they went to do their test BRC D3. Both horse and rider tried their best and did a very accurate and smooth test. The judge was pleased too and awarded Caitlin 69.6% which meant they finished a very respectible 6th in a big class. Lisa Fahy was competing her horse Kings Court II in the Novice Dressage. The journey up on Friday entailed the usual M25 car park but once on the M1 it was a lot easier - but still took over 4 hours. Whilst KC settled into his stable Lisa and her daughter Caitlin got their sleeping arrangements sorted (ie the horsebox)! Lisa then took KC for a stroll around Keysoe and had a run through of her test in the warmup arena. The next day was an early start for the Arena Familarisation session at 7am. KC was on his toes and demonstrated on the way to the arena that he could do airs above the ground and piaffe! It certainly made for a quick exit of other riders/walkers along the track to get to there - but once in the main arena he settled pretty quickly luckily! The weather was kind and the sun came out at lunchtime. It was then Lisa's turn. Cathy Hughes was stewarding at the competition so was able to take Lisa down to the arena and watch. KC was very well behaved and did a nice relaxed test. There were 19 in the very strong class and she came 4th. Luckily the journey home was much easier and KC was able to be out in his field by 9pm - a much happier place for him than a stable! Julie Johnson wrote : "Thank you to everyone who represented the club in our own area friendly today at Merrist Wood. You are all truely amazing and make my 'job' as team manager a lot easier 'coz you come out and have a go and have fun! Well done to everyone, in and out of a team! Team Sapphire came 5th. Full results here with links to the photos. 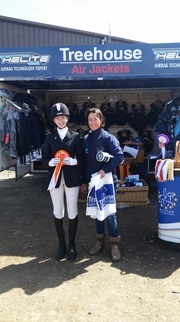 Thanks to all helpers and especially Cass Lillington and Ro Major"
"Thank you to the team who represented this club last Sunday at Merrist Wood at the Dressage Intermediate Qualifier. It was a really tough day and credit to Lisa Fahy, Caitlin Fahy, Victoria Louise Chuter, Lauren Louise Spinks and Jenny Tully for turning out at all!! Unfortunately the team wasn't placed but we had some great individual success stories with Lisa Fahy and Caitlin Fahy both qualifing as Individuals and Jenny Tully coming 5th in her class. Next stop is the 'area 11 friendly' on home turf on Good Friday"
No placings today but lots of individual good rounds and lots of fun had with the team. Well done to all who competed. Well that was a wet day!! Firstly, thank you to all our lovely members who showed up at the Priory today, whether you were competing or supporting you made a wet, miserable day a lot more enjoyable! Secondly, the results, we entered three teams.....the Albury Fables of Lisa Fahy, Caitlin Fahy and Jacqui Peterson came 4th! Our other two teams came joint 10th. Well done everyone. It was tough out there today so massive thank you for turning up! We had a good day, nonetheless with cake and prosecco and quite a lot of laughter! The Show Jumping Team consisted of Karen Stone, Lynn Roberts, Lauren Louise Spinks and Hilary Smith. Jenny Tully (Team Manager) wrote the following: A huge thanks and well done on yesterday's effort. I was really impressed by the team spirit and the adaptability to deal with a competition that started nearly an hour later than advertised. Due to some dodgy accountancy maths we actually ended up 4th, out of 8 teams I believe. Those of you who have 3rd rosettes, don't worry about them and I will get the 4ths out to you. 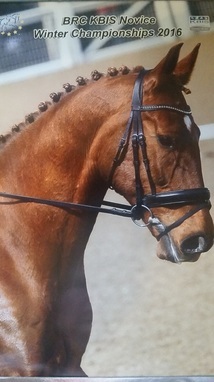 This is the first time we have had an Intermediate team entry for ages and special mention must go to Lynn Roberts for riding a "strange" horse. My lasting memory is of the whole team, standing in the darkness together, chatting away with a real sense of a team. Thanks ladies. Following the item in the October issue of the Newsletter, we had enough willing volunteers to enter two teams this year for the Quiz, & only one person had to be press - ganged (a bit!) - Helen Kendall, Sylvia Laney & Helen Steers (who unfortunately couldn’t make the evening in the end), and Veronica Keywood & Jenny Tully who made up a team with myself. We duly arrived at the appointed pub (The Watermill in Dorking) and got the important details sorted out – namely, what to eat & drink! Team members got together and made themselves comfortable – while I was effectively “nobbled” by Penny Jann from the Elstead team talking about Area stuff (acunning distraction ploy on her part, obviously!). 8 Questions started – what a relief, not the sort of esoteric rounds from recent years on such as horses in art & literature, but a return to more general knowledge, the countryside (we did well on that round! ), and who’d done what at events like HoYS recently. I have to say, though, we weren’t pleased to see the return of the amorphous diagram of a horses leg, with 10 areas marked, for which we had to name the relevant injury or disease - tricky! We soldiered on – Jenny answered a good few, Veronica knew some helpful things about breeds, and I had a couple of brain - waves and backed the right guesses. But annoyingly we each managed to talk the others out of some correct answers too... Anyway –after six rounds, we (Veronica, Jenny & I) ended up fourth after a tie-breaker question between four teams, and Sylvia & Helen were seventh – we all agreed if they’d had their third person, their pro-rata score would’ve probably won! There was only a point in it between the winners, Chipstead (who, despite organising the Quiz for years have never actually won until now), Newlands Corner (second) & the teams equal for third before the tie-breaker – an exciting finish! I’d like to record a huge vote of thanks to all the team members for coming along and representing the Club at this sociable occasion, and Chipstead RC for running the quiz yet again – it must take ages to get all the questions together every year. We had two teams entered with a mixture of new and old members. WSRC Angels came 3rd and WSRC Fillies came 5th with lots of individual placings too. Full report to follow. On Sunday, 15th November Area 11 ran a “friendly” show jumping competition at Elstead RC field. The format was teams of three, where one person jumps 75cms, one jumps 85cms, and the third member jumps 95cms. Initially we had six members volunteer which gave us two teams. Unfortunately, two members fell by the wayside, however we were able to replace them at short notice and we sent two teams – the Farley Fillies comprised of Samantha Petri, Gemma Saulis and Lauren Louise Spinks, and the Albury Angels were Tina Pendle, Karen Stone and Pat Murphy. In the 75cms round, Samantha had an unlucky pole down but had been rushed into the ring after very little warm up. Tina nursed a very green horse around, had one run out but rode it well. For the 85cms round, Gemma had one pole down and Karen went clear to the jump off to finish 4th individually. Finally, in the 95cms, Lauren went clear through to the jump off to finish 6th individually. Pat did a fantastic clear round to come 3rd individually after the jump off. Overall, the Albury Angels came 3rd and the Farley Fillies came 5th, so an excellent effort all round. It was particularly gratifying to see some new faces in the teams and I hope they enjoyed the WSRC experience enough to do it again! As usual, there was a picnic, albeit basic given the time of year (and possibly the only team picnic of the day) and special mention should go to Sarah Fisher who stood in as team manager. 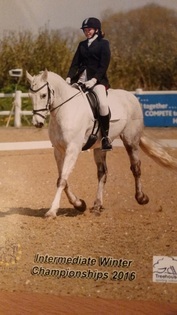 11th October - Congratulations to Jenny Tully who came 6th in the L&SE Dressage to Music Final! Back in May, with jumping taking bit of a back seat at the moment due to a pair of dodgy knees, I thought Gero and I could have a go at Dressage to Music, and set a goal of the DTM qualifier at Plumpton College at the end of June. Having never done this before, it was bit of a baptism by fire, having only five weeks in which to join BD, get the list of permitted moves from BD, create a floor plan, video the floor plan, change floor plan, video floor plan again, find a man who could do the music, choose the music and send video to music man, receive music back, send it back three times for minor tweaks and practice, practice, practice! compilation of Depeche Mode - but it is certainly very different! Since June, I have been entering every DTM competition I could find in order to get practice of the different arenas and surfaces. My husband bought me a HUGE speaker to play the music outdoors at 120 decibels and I think I can safely say that after 3 months, me, the horse and all the neighbours are fed up of Depeche Mode now! gradually got faster (no idea how that one panned out!) and then it was our turn. With the familiar strain of “People Are People” we set off down the centre line. The massive spook at the flower pots only added cadence to the stride and we were going great guns. Unfortunately, in the countercanter, Gero threw in a flying change which is a banned movement, and I didn’t correct it. This resulted in the loss of a lot of marks, leaving us on 66.6% and putting us in 6th position. You win some – you lose some. It has been an amazing experience and I have learned a lot. Anyone want a collection of Depeche Mode albums?! Our Senior Team of Jacqui Peterson, Lynn Roberts, Fabienne Macey and Judith Dunne did really well to come 9th and our Senior Individual, Lisa Fahy, came 2nd and has qualified for the National Championships at Keysoe and our Junior Individual, Caitlin Fahy, came 5th. Chris kindly took some photos of the first 3 Team members and they can be found on our photo page along with photos of the final Team member plus the two individuals. Our Horse Trials team of Sarah Orchard, Tina Pendle, Hilary Smith and Pili Spiers competed at the London & South East Championships at Snowball Farm on Saturday 26th September 2015. The team had qualified at the BRC Hunter Trial at Coombelands earlier in the year. We were lucky that the weather was gorgeous and the ground conditions absolutely perfect. All four competitors performed good solid dressage tests. We had two clear rounds show jumping, with two other members each being unlucky and rolling a pole. All four team members absolutely stormed around the cross country course putting in really competent performances. The team finished just outside the placings, however, Pili was placed a fantastic ndividual 6th in her arena. All horse/rider combinations have really grown in confidence over the season which has been great to watch. We are hoping to field even more Horse Trials teams next year, so watch this space for some team training over the winter. Saturday dawned bright and beautiful and the merry band of WSRC Show Jumpers made their way across Surrey and Bucks to Snowball Farm in sunny Slough. Our intrepid team was made up of Carys Jones on Boris, Fabienne Macey on Arctic Bear, Sarah Fisher on Espionage and brand new Club member Bonita Kerr on Molly. The competition comprised a round of ten show jumps at 80cms, and then another round at 85cms. In the first round, the team had two clears, one pole down, and three time penalties, but we were able to discard the pole down. In the second round, we had just one pole down and three clears, so once the dropped pole was discarded, the team finished a very respectful 4th. Given the number of teams competing, this was a really good effort. Once the last of our show jumping team had jumped, it was back to the lorry park for the now infamous picnic and prosecco. Whilst everyone was getting stuck into the food and wine, I went to check on the final placings, only to be told that Carys had reached the jump off and was due in the ring in 18 minutes! The whole team mobilised to unload Boris, tack up, get Carys on, remove wine glass, learn the course and post her into the arena, where she did an excellent round, finishing 6th individually! So it was a wonderful day all round. Big thanks to the support people, especially Sue Porter and Sylvia Laney for lending their horses, the great team of helpers who turned up for the day, and to the riders for giving up their Saturday. On Friday 4 September, after not the best preparation in the world as my horse, Kings Court II had been out of work for a month and I only got back on board 5 days earlier – Caitlin, myself and my Mum set off with Moonshine Boy (Shaun) and Kings Court II (KC) to Lincoln. The journey up there was a long one but we made it safely with both horses travelling well and were nice and relaxed once we arrived. Passports and hats were checked and we were lucky to get some permanent stabling amongst some lovely competitors – it was such a friendly competition. After taking the boys for a little hack and schooling session to stretch their legs it was time to put them and us to bed as an early start the next day! I was first to go doing the Novice 24. KC settled down to the job and didn’t even mind the noise of the Red Arrows training near to us! The ground was rather hard so he wasn’t that keen on showing medium trot but we did a nice accurate test and scored 68.85%. I then had ¾ hr break before my Novice Riding Test. Time to get one test out of my memory and next one in hopefully! This was in a slightly softer area of ground which KC seemed happier working on. We scored 72.73% and I was really pleased with him. On our way back we saw Cathy Hughes (our Club Secretary/ Area Rep) who was being a great steward and helping to keep everyone organised! Once KC was settled back in his stable we went off to look for the scores. I came 4th in the Novice and 15th in the Riding Test. I was very pleased with one set of results but not with the other – but hey ho that’s Riding Tests for you! Then it was time to get Caitlin on Shaun and run through her test for tomorrow. As they had an even earlier start time than me on Sunday we decided to plait up Shaun and then take the boys for a nice meal of grass around the cross country course before we settled down for our dinner and watched a DVD! On Sunday it was Caitlin’s turn. Shaun was rather on his toes the day before after not being out in his field (ours live out 24/7) so I made the decision then that I’d be lunging him before Caitlin got on him - which was definitely the right decision and Shaun thought he would demonstrate Airs Above The Ground like a Lipizzaner Stallion! Caitlin then got on Shaun and set about preparing for her Prelim Riding Test. Once she was on board Shaun was much better behaved to our relief! He settled down quickly and soon forgot about KC in the stable and got on with the job in hand. Caitlin rode a lovely accurate test and scored 74.09%. Caitlin did WSRC proud by coming 10th in the Prelim Riding Test and was quick to point out that she’d beaten me and was obviously the better rider that weekend!! We all had a great weekend up in Lincoln and could not have done it without the support of our family and my wonderful Mum who came along with us and of course WSRC. We hope to be back next year and will try to do even better! So to all our members out there why not give it a go representing WSRC at team events? If there are not enough members to make up a team we send an individual (which is what we were this time). There is dressage, dressage to music, riding tests, show jumping, eventing and many more disciplines. So what are you waiting for? Contact a committee member if you want to have a go. I just want to thank everyone who made the effort to volunteer and represent WSRC plus the small but extremely enthusiastic bunch of supporters that turned up on Saturday. Sadly we did have a couple of last minute changes due to injury [get well soon Jenny] and transport problems and I once again I would to apologise for making the final decision so late on Friday night but I did not have access to all my emails until I eventually got home from work!!! It was a relaxed, well organised and friendly event run by Chipstead Riding Club admittedly the going was hard but mostly the arenas rode well and did not cause too many problems during the course of the competition. Although we didn’t quality, one Team was placed and we had some very consistent results and everyone seemed to be pleased with the way their horses performed. 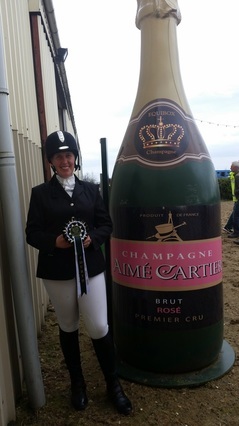 A Special mention has to be made of Lisa Fahy, who won her Novice arena and is off to the Nationals, along with daughter Caitlin, who qualified as an Individual Junior in the BRC Prelim Riding Test. 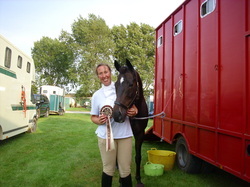 Also congratulations to Judith who did a really calm and accurate test and gained a fabulous score of 68%. But everyone did well and there were some good scores and flurry of rosettes awarded at the end of the day. For those interested in viewing the results for the whole event they should be available on the BRC Riding Area website shortly. Christoper Lee took some great photos of the day - click here to view them. Caitlin Fahy was flying the flag for WSRC at Bury Farm - her first time ever riding at a big Championship Show and also a first for Moonshine Boy (Shaun)! This was Shaun's first time staying away at a competition venue. He was lucky and had a lovely large permanent stable whilst Caitlin and her mother Lisa shared the luton of their old lorry which was not nearly as spacious! It was a very wet and windy weekend and Caitlin was glad of the chance to do an arena walk with Shaun early on Sunday morning. Luckily there was a break in the rain just as Caitlin got on to start her warm up but the wind was still there and affecting quite a lot of the horses including Shaun, but Caitlin remained nice and calm and got Shaun's trust back. Then the time came to enter the arena for the Prelim 13 class. They both tried really hard and despite Shaun calling out a couple of times, produced a lovely smooth, calm and accurate test and finished with Caitlin riding out of the arena with a HUGE smile on her face! The BRC Team were being very efficient and it wasn't long before the scores were put up. It was a very close class with the last four placings all on 67.?%. Caitlin and Shaun ended up 11th (out of 30) with a score of 67.08% just missing out on a rosette by .42% - but that didn't matter - they had an amazing time at a wonderfully run event and can't wait to get out there again and represent West Surrey Riding Club. 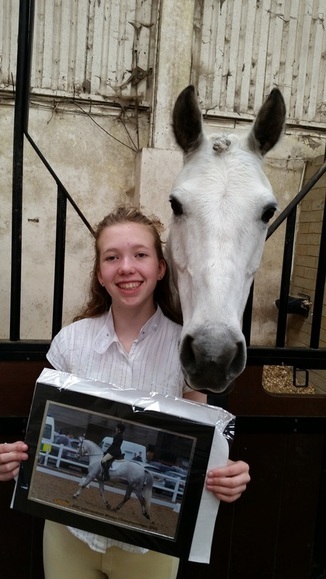 Caitlin left Bury Farm with great memories, a lovely photo and a personalised hoodie! During the weekend poor Caitlin had a terrible cough and hardly slept. Once home she went to her Doctors and was put straight on antibiotics because she had a nasty chest infection - so that made her weekend all the more impressive that she'd managed to do so well whilst feeling so poorly! Yet again WSRC did good! "West Surrey Girls" - Julie Rowley, Judith Dunne and Sarah Fisher came 4th and "West Surrey Divas" - Carys Jones, Sarah Orchard and Sarah Davey came 6th. Full report to follow soon. After a few last minute withdrawals namely due to 12 puppies arriving, sickness bugs and family matters, and a bit of frantic emailing and calling around by me (Lisa Fahy) instead of fielding two teams for the above quiz we just sent the one - called West End Girls. The team consisted of Kathy Merrick, Cathy Hughes and Veronica Keywood﻿. That team obviuosly has lots of "good horsey knowledge up there" as they only went on to WIN!! Huge thanks go out to the ladies for giving up their Monday evening to represent the wonderful West Surrey Riding Club! Lets hope at the next Area 11 Quiz we can retain the title! Here's a quick update on how today's events panned out. There were some extremely strong teams fielded and some 20 teams fighting for places so although we all acquitted ourselves very well, today we weren't in the ribbons. I know I had a really fun day and what made it so enjoyable was seeing other club members and being part of a great team with their horses best interests at heart. Thanks to Vicky Palmer for organising and I know she would thank everyone who took part, if she was writing this email. Also thanks to various helpers, readers & photographers and to Sarah Fisher for force-feeding me chocolate croissants ... that really didn't help the rip in my jodphurs! We all live to trot another day so look forward to seeing you all out competing when the riding club teams kick off again next year. Patrick Murphy was a great team manager and had three teams out competing at the Chipstead National and London & South East Qualifier at Bookham Riding Club's field last weekend. Although we were not placed as teams (we did have individual placings) we all had fun and quite a few new team members have expressed a wish to do it again. The riders making up the teams were : Joan Scott, Olivia Scott, Erica Laurence, Georgina Notts, Judith Dunne, Vicki Glynn, Lisa Fahy and Rosie Swain. You know, WSRC quiz teams are a bit like buses – you wait a couple of years for one, then two turn up together! With a bit of judicious encouragement by Lisa and Vicki, this year we managed to field the Wild West team, consisting of Vicki Glynn, Jackie Ellis & Steph Chamberlin, and West End Girls (myself, Veronica Keywood & Jenny Tulley). Jenny very kindly hosted a team get-together beforehand at her (lovely!) apartment in Charterhouse, to get our brains working. I must admit to being a bit sceptical of the benefits of this (isn’t this a bit like O-level revision - surely my brain is always working?! ), but it was actually a really helpful thing to do. We pored over Jenny’s collection of Pony Club quiz / exam books & Google down-loads (between catching up with the goss, obviously! ), and slowly it dawned on us we knew quite a bit – and, of course, didn’t know a whole lot more! So we duly arrived at the appointed pub at the specified time and got the important details sorted out – what to eat & drink (chiefly coffee for that stay-awake factor). Time for a last look at the revision books, and questions started – but oh no, not the usual sort of things about horse care & biology, and who’d done what recently, but horses in art & literature (uh-oh! ), racing & hunting (we did surprisingly well on that round – some of the questions had featured in Revision!) and, of course, the Olympics (not such a great round, considering they were only 6 or so months ago) – and if you know anything about any of these, you can join the teams next year! Anyway – after six rounds, we (WEG) ended up fifth (so not last – hoorah! ), and Wild West came a very creditable third. I’d like to record a huge vote of thanks to all the team members for coming along and representing Club, Lisa for organising us enough to get entries done in the first place, and Chipstead RC for running the quiz yet again – it must take ages to get all the questions together every year. Here is a very proud Salviano and Lisa Fahy after their 9th position in the Novice Dressage on Saturday 15th September 2012.